UPDATE: Three of my business ideas have launched! I’ve always had a lot of excuses. I can keep letting fear run my life… or I can take a risk to be happier. In 2018, one of my BIGGEST goals is to launch my own profitable idea. By June 2018, I want to be making $2,000 per month. By January 2019, my goal is $50,000 per month. I set the end goal REALLY high because it pushes me to take big risks and think outside the box. If it was a small amount, it would be less motivating. 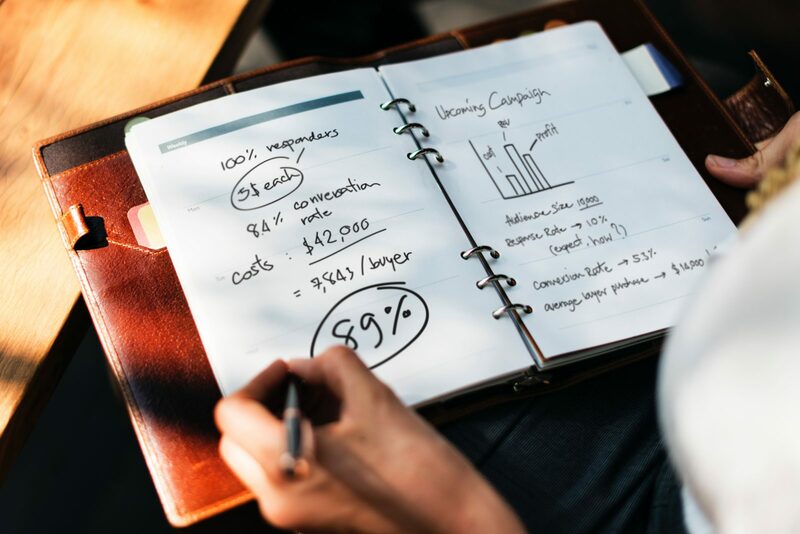 With my goal set, here are the 3 steps I’m taking to launch my business ideas. Inspired by James Altucher and my friend Evan Shoemaker, I pushed myself to come up with 10 ideas per day. The process was messy. A bunch of days I forgot to do (which meant I caught up on following days). But from December 9th to January 31st, I came up with 550 ideas. The goal was to push myself to think outside the box. No restrictions, no limits… just crazy ideas. It was difficult, but powerful. Try it for yourself to see. Action Step: Every morning for a week, write 10 business ideas (or ideas to make your life better). 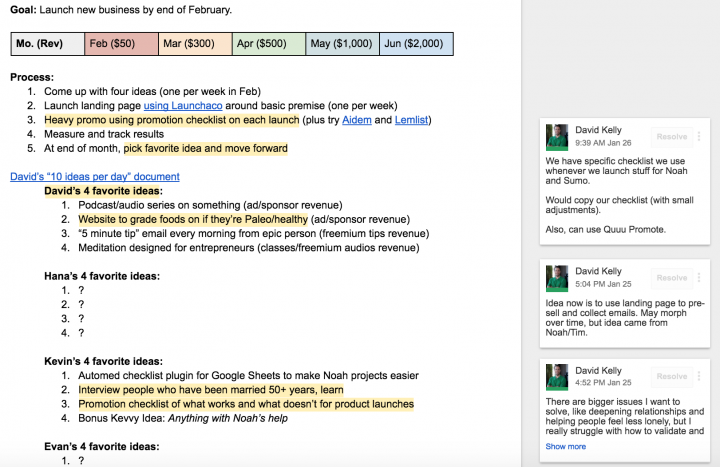 Record your creative business ideas in a Google Doc to revisit later. After I came up with a list of business ideas, it was time to narrow them down. I created a second Google Docs file — and named it Let’s GOOO!!! David’s 2018 idea launching — to help inspire me. In this doc, I wrote a basic launch plan and monthly revenue goals. Then, I picked my four best ideas — and asked my girlfriend Hana, plus my friends Kevin Espiritu, Evan Shoemaker, and Scott Tousley, for their four favorite ideas from my list. My plan was to launch one idea each week in February. I think most people get really caught up in trying to perfect everything before launching. I know I did. But I’m modeling my “four ideas in four weeks” approach after Tim Ferriss‘ theory that it’s better to set a date of launch and launch in time than aim to get 100%. This philosophy helps prevent analysis paralysis. Or, as a mentor once told me, sometimes it’s better to launch a bad idea than no idea at all. My friends and I listed our four favorite ideas based on my list. From the lists all of us wrote, I picked the top four ideas I wanted to put my focus. Then, I was ready for the last step. 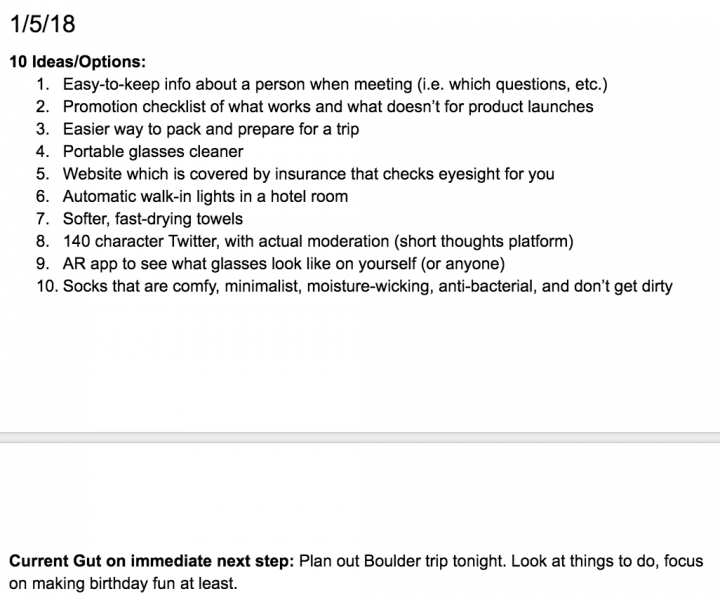 Action Step: Having a list of ideas is great, but it’s important to narrow down and take action. This month, pick one idea from your weekly list of 10 ideas and launch it. With my ideas picked, I started putting together my basic promotion plan. The goal wasn’t perfection. It was to share with as many people as I could, knowing the time restrictions from my full-time job and life. At the end of the month, my goal is to see if any business ideas had any good results so I can build them further. I created a new Google Doc — You CAN do it!!! 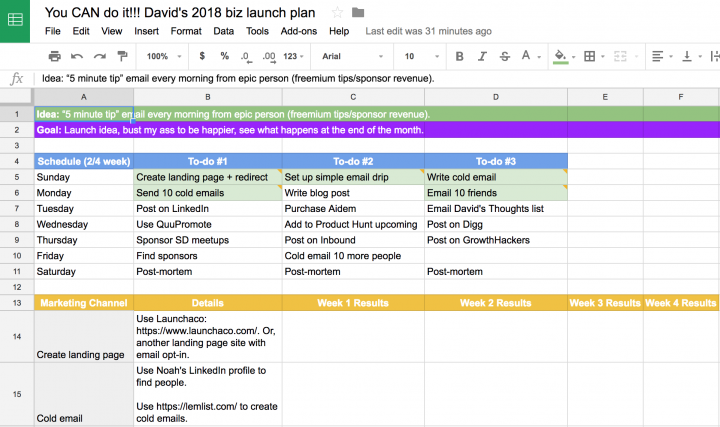 David’s 2018 biz launch plan — and got ready for launch. The green highlighted rows are what I’ve completed so far. You’ll also notice the little comment marks in each row — that’s how I note who I’ve emailed and details about the task. The final step to launching my business ideas is still a work-in-progress. Next week, with my second idea, I might update the launch plan and remove some promotion items while I add others. We’ll see how it goes, but I’m excited for the journey. Action Step: After you come up with the one idea YOU want to launch this month, think about a promotion plan. It doesn’t need to be complicated — I recommend one different promotion task per day for a week. See how it goes… and it might just work out! David, it should be easier get newsletter from you!